Δε χρειάζονται ιδιαίτερες γνώσεις και απλή κοινή λογική για να καταλάβεις ότι τα περισσότερα μοντέλα που παρουσιάζονται στην SEMA, είναι μια διαφήμιση των εταιριών για το “τι θα μπορούσαν” να κάνουν και όχι “τι θα” κάνουν. Πάντα, όμως, υπάρχουν και εξαιρέσεις, όπως για παράδειγμα τα παρακάτω Mazda 6, το οποίο παρόλο που δεν είναι ούτε ένα χρόνο στην αγορά, η φετινή SEMA είναι η πρώτη έκθεση που βλέπουμε τις βελτιωτικές προτάσεις που μπορούν να τοποθετηθούν στο ιαπωνικό sedan. Κατά τ’άλλα το Ceramic 6 φοράει και αυτό 20άρες ζάντες της Rays Volk Racing Original G25, στο ίδιο ασημί χρώμα με το αυτοκίνητο. Πανομοιότυπα με το Club Sport διαθέτει ελατήρια χαμηλώματος της H&R, μεγάλα φρένα από την Brembo και εξάτμιση της Racing Beat. Στο εσωτερικό υπάρχουν νέα premium μαλακά δέρματα σε άσπρο και μαύρο με μικρές ασημένιες λεπτομέρειες. Τέλος, υπάρχει και το Mazda3Vector Concept, που είναι βαμμένο σε κόκκινο Soul Red και πατάει πάνω σε ζάντες Rays Volk Racing Original G25 διαστάσεων 19 ιντσών και ελαστικά Yokohama S.drive διαστάσεων 225/40, ενώ και εδώ συναντάμε ελατήρια χαμηλώματος της H&R και φρένα της Brembo με τρυπητούς δίσκους διαστάσεων 365x29mm. LAS VEGAS (November 5, 2013) – Motorsports and Mazda are so synonymous one seemingly cannot live without the other, less yin-and-yang and more peas-and-carrots. And while the brand may never disconnect from its Zoom-Zoom roots (nor want to), competitive aggression on the race track need not translate into gritty, abrasive design. There can be finesse in fire, beauty in brawn. This was the inspiration behind the latest concepts from Mazda North American Operations’ (MNAO) Irvine, Calif.-based design team. The four vehicles made their official debuts today at the annual Specialty Equipment Market Association (SEMA) Show. 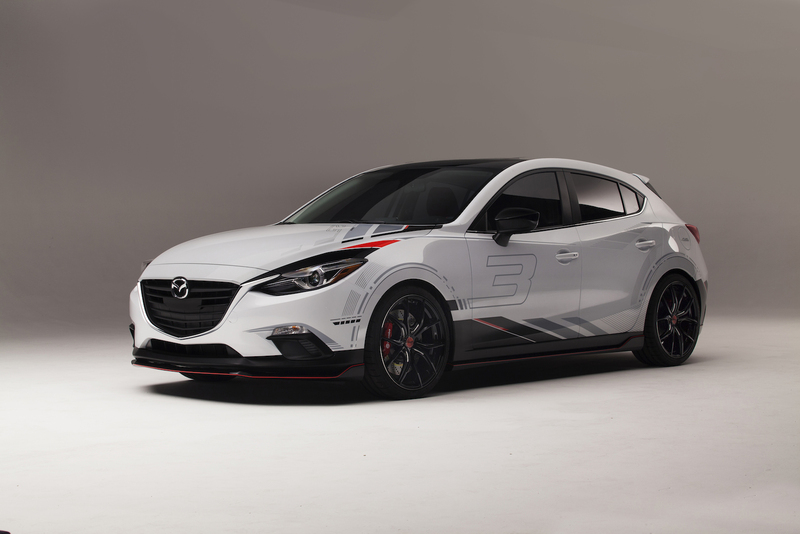 All-new 2014 Mazda3 and Mazda6 vehicles were utilized to showcase distinctively fresh designs paying homage to the brand’s racing heritage and awakened design direction. Club Sport Concepts Both a Mazda3 and Mazda6 were given “Club Sport” treatments, a motorsports-inspired motif of neutral grays, blacks and reds represented in not-so-subtle angular lines reminiscent of a car speeding past your line of sight. 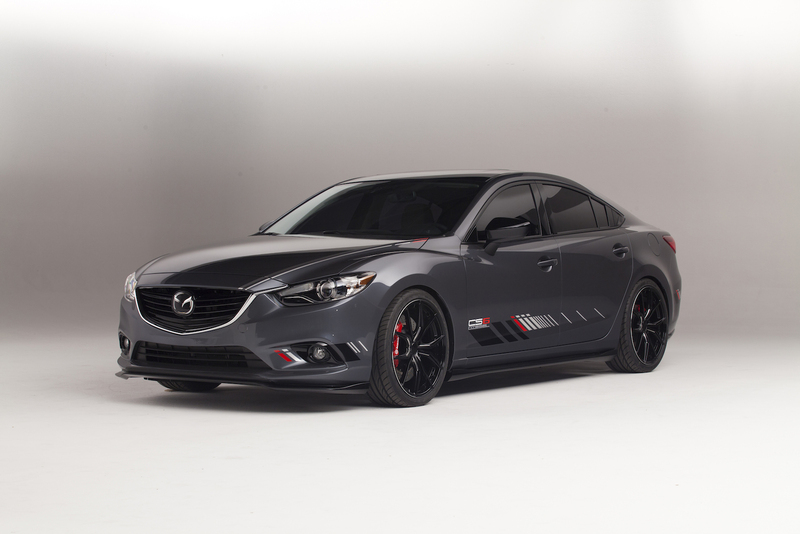 Featuring a Mazda Design-exclusive Composite Grey finish and Brilliant Black rooftop, the Club Sport 6 Concept is outfitted with a 14.0:1 low-compression SKYACTIV-D 2.2-liter clean diesel engine. Although this vehicle features a European-specification engine with an output of 129 kW at 4,500 rpm and 420 nM of torque at 2,000 rpm, the North American clean diesel will be available in late spring of next year. The SKYACTIV-D 2.2L engine was most recently seen on U.S. shores during the final season of the GRAND-AM Rolex GX Series, where the rookie Mazda6 took the checkered flag nine straight times and finished the year with manufacturers and rookie-of-the-year driver’s championship honors. The exterior surface is painted with custom Club Sport graphics, featuring varying line frequency and width to create a sense of movement. A Mazda Design custom accessory aero kit was installed, which features front, rear and side diffusers as well as a rear spoiler – all in a contrasting Brilliant Black gloss. The Club Sport 6 sits on Rays 57 Motorsport G07FXX 20-inch Black and Machining-colored 10-spoke wheels wrapped in sticky Yokohama S.drive® 245/35R20 tires. Suspension is courtesy of an H&R spring kit while custom Brembo two-piece, six-piston 380×32 drilled brake rotors and a Racing Beat exhaust add the final sporty touches. The Club Sport 3 Concept features many similarities with its Mazda6 big brother but with a few extra robust features. 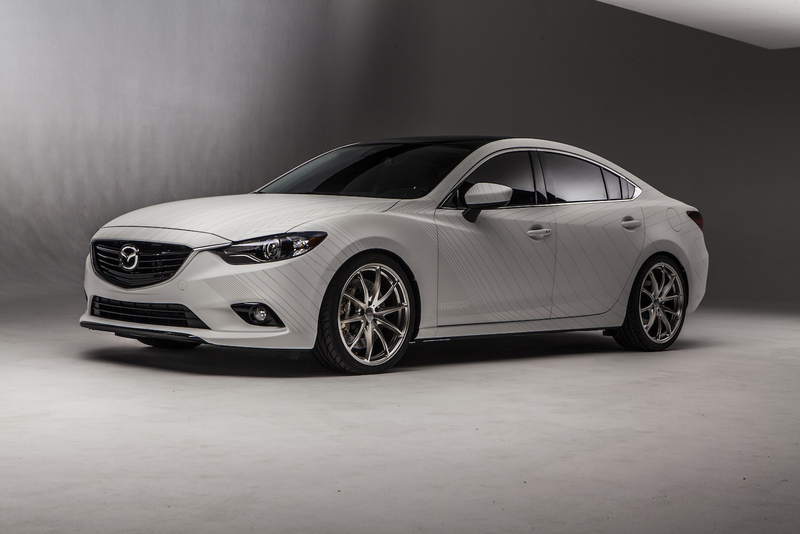 With a Mazda Design-exclusive Slate White exterior finish, this five-door is furnished with a more ambitious Club Sport paint scheme. Metallic Silver lines trace along the arches of the wheels, the base of the side skirts and the contours of the doors and C-pillars. Glossy Light Gray and matte Black Mica mimic some of these patterns but with louder, wider direction. Vibrant Red vinyl follows along with thin lines, providing contrasting texture and dynamic flow. The only other non-painted surfaces are the dramatic alpha and numeric Black vinyl call-outs of the fuel door, tire size and SKYACTIV®1 TECHNOLOGY pronounced across the hood. Like the Club Sport 6, the Mazda3 variant features a Mazda Design-developed accessory aero kit which adds the body color-contrasting Brilliant Black front, rear and side diffusers along with a new rear spoiler style. Designed in North America, this aero kit will be made available for all 2014 Mazda3 vehicles sold worldwide. Pricing will be announced closer to its on-sale date. Equipped with a SKYACTIV-G 2.5-liter gasoline engine, the Club Sport 3 features a modified SKYACTIV-Drive six-speed manual transmission derived from Mazda’s CX-5 compact SUV. Using a short 4.7:1 final drive ratio, the gearing is 20 percent shorter than in a SKYACTIV-G 2.0-liter-equipped Mazda3. The Club Sport 3 also utilizes a Wavetrac® helical limited-slip differential for additional torque. Added performance features include a CUSCO coilover kit, a Racing Beat performance exhaust and Brembo two-piece, six-piston 380×32 drilled brake rotors. Rays 57 Motorsport G07FXX 20-inch Black and Machining-colored 10-spoke wheels are packaged with Bridgestone Potenza™ RE-11 235/35R19 road-gripping performance tires. Not to be outdone, the Club Sport 3’s interior offers its own “pop” with Red aniline leather throughout – seat trim, door panel inserts, center console, IP décor and a steering wheel stripe. Premium Black leather is reserved for the steering wheel, arm rest, emergency brake and shifter boot. The front seats feature perforated leather within the seat bolsters with a diffusing line pattern in the seat back creating a “3,” identical to the Metallic Silver numeral painted onto the vehicle’s driver’s side door. Stitching patterns also spared no expense with trapezoidal Momo-inspired contrast-Red stitching on the steering wheel and double-stitched tonal deck seams on the doors, seats and IP. The steering wheel features a single Red aniline leather strip at the minimalist but top-of-mind high-noon position. Vector 3 Concept Shifting gears from fast to fashion, the Vector 3 Concept offers a different take on controlled aggression. First on the exterior, the base color is Soul Red, a stock Mazda hue as sultry and intense as the certain little black dress that takes your breath away. 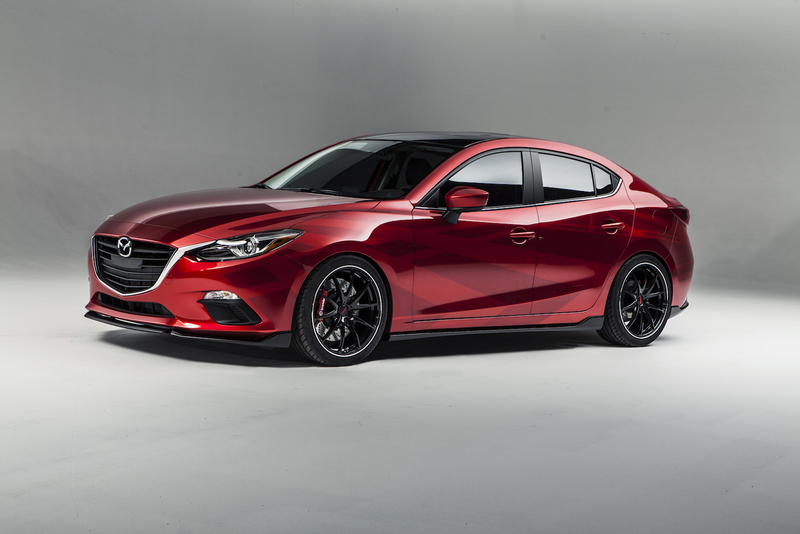 Derived from Soul Red is a Mazda Design custom blend of Deep Crimson in varying shades of depth to highlight the “fractured line” treatment of the paint finish’s vector pattern. Following the form in which reflections bounce off the vehicle’s KODO design facets, the vector shapes of variable length and width are identical on other side of the concept car. Although a pattern inspired from the runways of the fashion elite, the Vector 3 hones its attitude from the world of active lifestyle and performance wear. Fitting like a stylish pair of cross-trainers, the Vector 3 offers little fuss but commands plenty of attention. A set of Rays Volk Racing Original G25 19-inch wheels are encased in road-hugging Yokohama S.drive® 225/40R19 performance tires. Other performance features include an H&R spring kit and Brembo two-piece custom four-piston 365×29 drilled rotors. Ceramic 6 Concept Continuing on the theme of uncompromised performance draped with unconventional yet beautiful design enters the Ceramic 6 Concept. While similar to the Vector 3 in that its design pattern is identical on either side, this also is where the likeness ends. And where the Club Sport concept vehicles emphasized their racing heritage, the Ceramic 6 focuses on racing patterns. The Ceramic 6’s exterior finish is an eponymous Ceramic White littered with Taupe Silver accent stripes. Such as the linear frequency patterns found on the likes of couture dresses and flowing fabrics, Ceramic 6’s garb radiates a presence of serenity and pureness. Using a base metallic followed by a satin quality clear paint, the vehicle’s matte white finish was achieved. Matching its accent lines Ceramic 6 rides on Rays Volk Racing Original G25 10-spoke, 20-inch wheels finished in Taupe Silver. Performance accessories include an H&R spring kit, a Racing Beat custom dual-exhaust and custom Brembo two-piece, six-piston 380×32 drilled rotors. The interior resembles something out of a Milan fashion studio with premium soft leathers, intricate stitching and overlapping weave patterns. Easily an outfit that can be presented on the runway, the Ceramic 6 further distances itself from the Club Sport 6. Where the Club Sport represented motorsports and historical drives, the Ceramic 6 is reminiscent of Rodeo Drive. Yet as dissimilar in design as the two mid-size sedans are, no one can deny that they remain genetic twins – built to perform and handle roads with prowess, regardless the exterior’s cloak. Featuring supple full-grain leather all around, the White presents a canvas clean in appearance that boldly complements the dark interior features such as the premium Black leather of the steering wheel, arm rests, emergency brake and center console. Accented metallic details provide a warm transition between the tones. Wrapped in Black leather, the steering wheel displays Light White Momo-style stitching and finished with a matching leather strip at the high-noon position. Comprising the front and rear seat inserts are interwoven light and dark White leather while hand-sewn Burgundy stitching further highlights the dynamic contrasting design. Light White leather inserts featuring the same hand-sewn Burgundy stitching pattern adorn the doors and is featured along the instrument panel décor in the same fashion. Mazda North American Operations is headquartered in Irvine, Calif., and oversees the sales, marketing, parts and customer service support of Mazda vehicles in the United States and Mexico through nearly 700 dealers. Operations in Mexico are managed by Mazda Motor de Mexico in Mexico City. For more information onMazda vehicles, including photography and B-roll, please visit the online Mazda media center atwww.mazdausamedia.com.